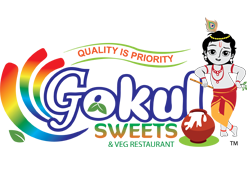 At Gokul Sweets, we stand behind all of our confections and guarantee that it leaves our store in optimum condition and arrives at your home in the same condition. If you are not satisfied with quality of our handmade product, let us know immediately and we will refund your purchase amount (excluding shipping and handling charges). Keep in mind that since a highly perishable product, we cannot provide refunds or exchanges for product that is damaged or melted due to delays in transit, as outlined in our Shipping Guidelines. If you pick-up products at our store and are not satisfied, we are happy to provide you with either a refund (accompanied with the original receipt) or replacement product. Please return the remainder of the uneaten product in its original packaging. Please note that once the product leaves our store, we can no longer be held responsible for potential damages that may occur due to exposure to heat, direct sunlight, refrigeration/freezing, breakage in transit, product that is not shipped by us, and/or other forces beyond our control. If you have any additional questions that are not answered in this section, please email (info@gokulsweets.com) or call us ((404) 955-3786) and we’ll be happy to assist you.